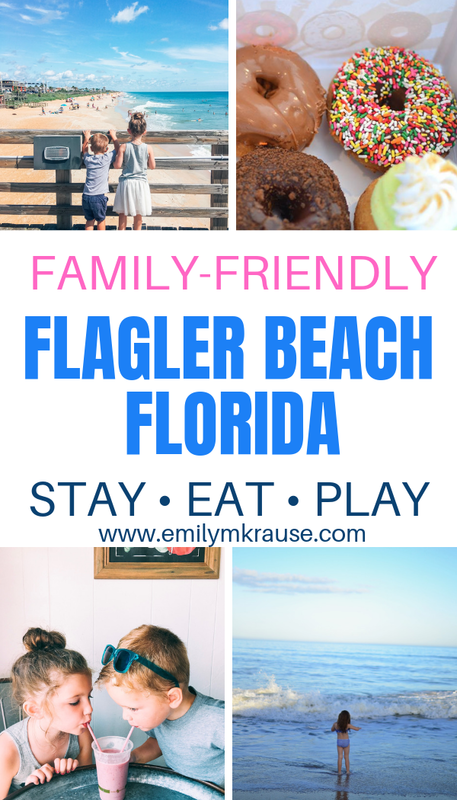 If your family is looking for a quiet spot to enjoy Florida’s sun, sand, and ocean waves without the throngs of tourists, then Flagler Beach is the spot for you. However, there’s actually so much more to do than just lay on the beach all day, which you’ll need to know if you’re traveling with kids. As much as they love the beach, they do get restless. Also, if you have a toddler that eats sand or constantly runs toward the waves, you’ll likely need a break, too. 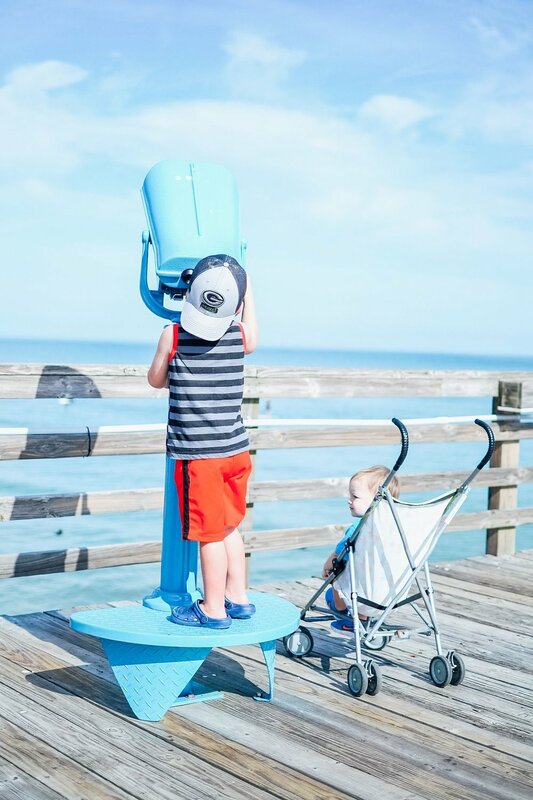 Here’s what to do in Flagler Beach with kids. Honestly, this is the highlight of staying in Flagler Beach. The beach is free, beach parking is free, closer to the pier there are lifeguards, and everything you need from food and ice cream to sunscreen and surf gear are located right across the street from the beach. The beach never gets too crowded, and if you want a very solitary experience, just keep driving (or walking) farther from the pier. A word of warning, though: the gorgeous cinnamon sand is made from coquina shells, and it NEVER COMES OFF. We have tried the baby powder trick, and it’s got nothing on this sand. It will cling to your skin for dear life. Totally worth it, though. Any beach town worth its salt (see what I did there?) has a pier at the center of everything. Flagler Beach is no different. You can walk out onto the pier for $1.50 per person (they never charge me for the kids), or you can go fishing for a bit more. You can rent all your fishing gear at the little store on the pier, including your one-day fishing license. Make friends with the locals who spend their days soaking up the sun and casting a line. If you’re not out there to fish, you can make use of the viewfinders for 50 cents apiece and look for marine life in the distance. Dolphins are often spotted in the early morning hours, and recently we’ve even had a few whales breaching near the beach. It’s also just a really beautiful view of Flagler Beach, so if you like photography, this is a nice angle from which to capture the beach and town. There’s plenty of free parking near the pier if you’re driving. No stress. Flagler Beach has a few locally-owned shops across the street from the pier, so take your time wandering through the colorful buildings and duck into a few stores. You’ll find a few souvenir shops, some boutiques, and cafes. It’s a perfect spot to get a feel for the local culture. I also wrote about this in my guide to St. Augustine because it’s right in between the two cities. If you keep driving north on A1A from Flagler Beach, you’ll eventually get to Marineland Dolphin Adventure where you can see sharks, dolphins, and sea turtles, and if you pay extra for the experience you can swim with and feed dolphins. I went with my toddlers and we had an amazing time looking at the sea creatures and watching other people swim with dolphins (there’s a viewing area with chairs and bleachers to watch the shows or observe other people interacting with the dolphins). We walked up to the dolphin tank to get a closer look and the baby dolphins came over to the glass to “play” with the kids and even gave us a friendly splash. So cute! This is a really beautiful and unique state park. It’s $5 per vehicle to enter, and once you’re inside there’s a ton to do. You can do some hiking along the trails, stroll through the formal gardens, play on the playground, and eat a picnic lunch. The real surprise at Washington Oaks Gardens State Park, though, is the shoreline across the street from the main part of the park. It’s made up of coquina rock formations, and it’s wildly beautiful to behold. There are so many incredible parks and playgrounds for kids in Flagler County. For most of these you’ll have to drive across the bridge into Palm Coast, but it’s a nice change of scenery for the whole family, and will keep your kids entertained for a few hours. Our favorite by far is Holland Park (James F. Holland Memorial Park) because of the zipline for kids. The playground is really unique, too, and my younger kids are obsessed with the “bumpy slide”, a small toddler-size slide with roller bars. I will say this isn’t the most toddler-friendly park, but there’s still plenty of space for them to explore and run around. We also like Waterfront Park on the Intracoastal Waterway with a playground, a path along the Intracoastal, and a children’s memorial garden, as well as the Community Center Park which was just redone and has some truly innovative activities and play structures for kids. Rent kayaks or canoes at Gamble Rogers State Park and float down the Intracoastal Waterway. Rent a surfboard or take lessons from Z Wave Surf Shop near the pier, or rent a Stand Up Paddle Board if you’re not quite ready to surf. Bike A1A up and down the coast. Ride a horse at the Florida Agricultural Museum (ages 8 and up). There are so many ways to get active in Flagler Beach, especially if your kids are a little older! This is a favorite among locals and for good reason! 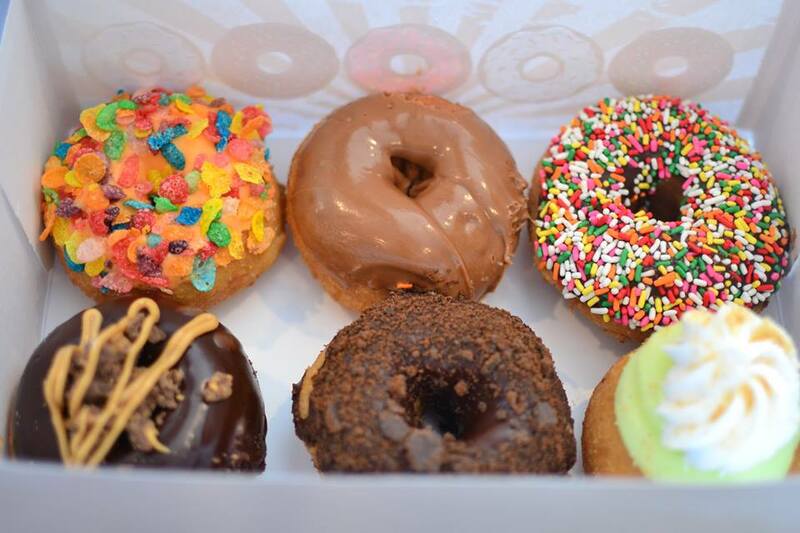 Swillerbees sells craft donuts with options like Fruity Pebbles, S’mores, Key Lime, and Unicorn Poop, as well as coffee, and you just can’t go wrong with that. Sometimes we’ll make the drive to Flagler Beach just to visit Swillerbees, and other times we’ll make a day out of it and pick up our box of donuts on the way to the beach. A word of caution: eating donuts on the beach with toddlers is a little bit of a recipe for disaster, and someone always ends up with sand-flavored sprinkles. This is by far our favorite local spot. The kids beg to eat here every time we drive along A1A in Flagler Beach. You can spend the day at the beach, then cross the street for lunch or dinner and dine downstairs around the tiki bar. The vibe is laid-back beach bar, so there’s no need to change or get dressed up. I would also suggest requesting a table on the rooftop for an excellent view of the ocean while you sip your bucket of margarita (parents) and enjoy the best fish fry in Florida. If you don’t like fish but don’t mind some cheese, then definitely try the nachos. You might want to split them with someone else, though! This is a quintessential beach town ice cream shop. You walk right up to the window and order one of their many flavors, then enjoy your ice cream at one of the shaded picnic tables around the shop. My kids love Cookie Monster and Superman, while I’m partial to Coffee Kahlua. The Funky Pelican is the only restaurant right on the pier in Flagler Beach. Definitely request a seat outside so you can dine right on the ocean. There are plenty of delicious seafood options and the chicken tenders and burgers are fabulous. Need a break from fish fries and ice cream? Head to Raw Juice Cafe for a healthy smoothie, raw juice, or smoothie bowl. They also have some wraps and salads if you need more solid meal. It’s a tiny shop a few streets back from the pier with the coolest mural painted on one of the walls. There are quite a few adorable and very affordable housing options in Flagler Beach on Airbnb. I always prefer to stay in an Airbnb when traveling with kids since we have multiple bedrooms, and can put the kids to bed early and still stay up and have adult time without disturbing them. We also love having a kitchen where we can cook our meals and save some money by not eating at a restaurant. Make sure to use my link to receive $40 off your first Airbnb booking, then simply search for “Flagler Beach” in the search bar. Hammock Beach Resort is a beautiful oceanfront property with the full beach vacation experience. The rooms are impeccable, and if you’re lucky enough to have a view of the ocean, imagine sipping your coffee on the balcony while the sun rises over the Atlantic. It’s absolutely stunning. There is a very kid-friendly pool area with a waterslide, and a lazy-river, beach access, a Kids Crew with daily activities for kids 4-12, a putting green, bike rentals, and surf lessons. Your family will hardly want to leave the property because there’s so much to do there! Si Como No Inn is a quirky and colorful option if you want something that represents the Flagler Beach vibe. Each room is different, and there are even options to fit larger families of 6 or 7. Several of the rooms are just steps from the beach, so all you have to do is roll out of bed and get your swimsuit on for a day of beach fun. This place is family owned and operated, so if you want a truly unique and authentic experience, this is the place to stay. Flagler Beach really is one of the most charming beach towns around, and the fact that it flies under the radar makes it even more enjoyable. So often in Florida, beautiful spots are crawling with people, and Flagler Beach has managed to remain a diamond in the rough. As a family travel writer, I can whole-heartedly attest to the fact that this is a very family-friendly destination. There’s plenty to do for the kids, and plenty for the parents to enjoy as well. Your family will love the laid-back, low-key vibe of the town, and you never have to get more dressed up than a swimsuit and cutoff shorts if you don’t want to. It’s also in proximity to a few “destination cities” in Florida that would make perfect day trips from Flagler Beach. You can take A1A all the way north for the scenic route to St. Augustine, or you can hop on the freeway for a slightly quicker drive. It’s only 30 minutes away, and offers so much history and culture, not to mention gorgeous Spanish architecture. Walk down St. George Street for shopping and restaurants, visit the Castillo de San Marco and the Fountain of Youth, climb the lighthouse, or see wildlife at the St. Augustine Alligator Farm. There are also beaches and splash pads if you didn’t get enough of the sun, sand, and water in Flagler Beach. Check out my St. Augustine with Kids Family Travel Guide for more information! If you head in the other direction you’ll end up in Daytona Beach. Just over 30 miles south of Flagler Beach, Daytona Beach makes an exciting day trip. Start at the Daytona Beach Boardwalk and Pier for arcade games, saltwater taffy, and carnival rides, take a tour of the Angell & Phelps Chocolate Factory, watch a Daytona Tortugas minor-league baseball game, or check out the Daytona International Speedway. 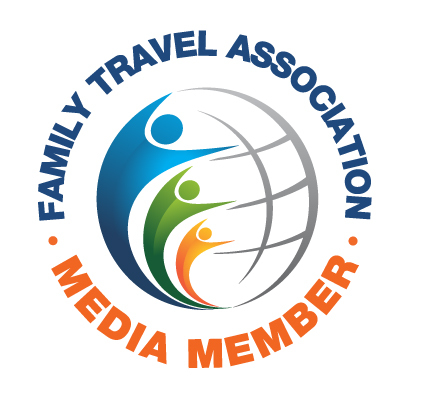 Check out other family-friendly Florida destination guides here! Sign up with your email address to receive news and updates, and get access to free resources like packing list downloads!